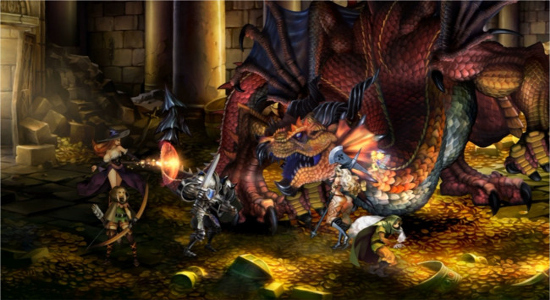 Murasama and Odin Sphere developer – VanillaWare – ‘officially announced’ its PlayStation 3 and Vita title, Dragon’s Crown. In equity to the publisher UTV Ignition, the game only showed up in last night’s Vita sizzle reel from the Sony’s press conference. The very VanillaWare-looking game is described as a “dazzling new multiplayer online adventure”, and boasts it as the first VanillaWare game that features HD graphics. In addition to this, DC has four player co-op with online functionality that will arrive next year. As for what game is about, all they said is that it’s a class-based dungeon crawler, set in a medieval fantasy world with knights and dragons. The game’s goal is to unlock the secret behind the ancient dragon that’s threatening the whole world. As with past VanillaWare games, DC is assured to be rich with hand drawn animation. And just like the other PS3/Vita titles, some form of cross-platform functionality will come packed in.